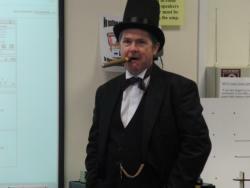 Trainee teachers were fortunate enough to receive a visit from engineering icon Isambard Kingdom Brunel earlier this semester. Peter, who was then the immediate past president of The Mathematical Association, is at the forefront of applying technology in mathematics and believes passionately in making mathematics engaging, practical and relevant. He was in Bangor to provide training on the TI-nspire handheld computer (Texas Instrument’s advanced development of a graphical calculator) and to give some of Bangor’s prospective teachers an insight into the practical cross-curricular aspects of mathematics. The trainees gained an insight into the possibilities that graphing software provides when teaching coordinate geometry, and they modelled the curves of the Menai Bridge chains with parabolas and quaternary equations. The TI-nspire also gave them the opportunity to investigate mathematical concepts from symmetry to statistics within an interactive, dynamic ICT environment, and, above all, it demonstrated the power of teaching and learning mathematics within a meaningful context. The importance of context is highlighted in the new Literacy and Numeracy Framework and this all day session, provided by Peter and kindly financed by Texas Instruments, exemplified the type of activities that both implement the Framework and engage pupils. "The session was really good as by using Brunel as a common thread he managed to link so many different mathematical topics (such as measurement, graph theory and quadratics) which made the session so engaging." "I really enjoyed the session as it was very interactive and practical which made it very compelling. Also seeing how hand-held networked graphical computers could be used for instant feedback gave the lesson an additional dimension. The variety of the activities meant that we covered a lot of (related) topics in the lesson and ensured there was never a dull moment". All in all, it was a very successful and enjoyable day, and the School hopes to welcome Peter back for a third visit next year. If you’re interested in reading more about Peter’s work, read this article in the Guardian: http://www.theguardian.com/teacher-network/teacher-blog/2012/nov/15/mathematics-crosscurricular-appeal.